How can I use an existing AV Receiver to power the CasaTunes music in a room? How can I integrate a more powerful amplifier to power a room, or power multiple pairs of speakers in a room? How can I connect CasaTunes to a 70V speaker system? How can I integrate a subwoofer? The CasaTunes 6X6 matrix amplifier is extremely flexible. Not only does the matrix amplifier provide six rooms with 50W of power, it also provides a pre-amplified output for each room, and a 12V signal that is triggered when a room is powered. Using these capabilities, we can solve many of the special installation requirements that arise. Many homeowners considering a multi-room system already have one or more AV Receivers installed in their home. More often than not, these receivers are configured as stand alone devices and while great for watching TV and movies, they are not part of your whole house music solution. Wouldn't it be great if there was a way to integrate these, and simply? CasaTunes makes it simple to seamlessly integrate your AV Receivers with your whole house music system, and you can even leverage the multiple zone capabilities of your AV Receiver, if these are available. Once configured, accessing your CasaTunes music in a room is completely transparent, regardless of whether your CasaTunes music is being driven through an AV Receiver, or through the CasaTunes 6X6 matrix amplifier. There is a separate Tech Note which describes in detail How to integrate AV Receivers in CasaTunes, but in essence you connect the pre-amplified outputs from your matrix amplifier to a configurable input on your AV Receiver, and configure our IP or RS-232 AV Receiver control modules for Denon, Harman Kardon, Integra, Marantz, Onkyo, Pioneer, Sony and Yamaha to control your AV Receiver. When you power on the room, CasaTunes will automatically turn on your AV Receiver and select the configured input. When you change the volume, CasaTunes issues the commands to your AV Receiver to adjust the volume, and when you power off the room, CasaTunes turns off the AV Receiver. If you need more power in a room, or you need to power an area that contains many speakers, you can add a power amplifier of choice, as shown in the diagram above (#2). The amplifier could be a more powerful 2-channel amplifier, it could be an amplifier like the CasaTunes 1240 Amplifier, which allows you to power six pairs of speakers, or it could be a 70V amplifier system, commonly used in commercial environments and used to power an almost infinite number of speakers. No matter what your special situation is, chances are you can use the pre-amp outputs from the matrix amplifier to connect to your power amplifier, and use the 12V trigger (#4 above) to control the power amplifier, turning it in and out of standby mode. When using the CasaTunes matrix amplifier, you can increase the power in a room by bridging two zones (see the CasaTunes 6X6 matrix amplifier manual for more information). Also, if you only need 2 pairs of speakers in a room, and you are using 8 Ohm speakers, you can connect two speaker pairs in parallel. 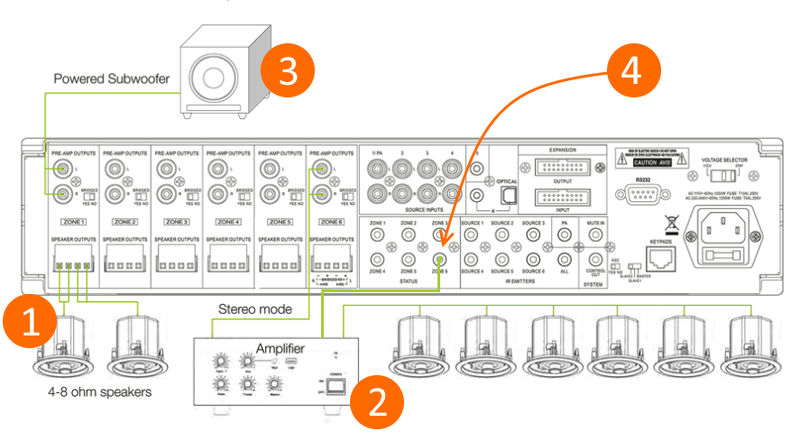 You can connect a powered subwoofer as illustrated in the diagram (#3 above). The best part though, is your CasaTunes Apps work the same way, regardless of how the music in a room or area is powered, making it completely seamless to customers. Plus, you get all the same great features CasaTunes adds to rooms, including; waking up and sleeping to music, using the CasaTunes keypads to control these rooms, including these rooms in room groups, etc.